Liquorice herb (Glycyrrhiza Glabra) has been used extensively in Chinese herbal medicine for thousands of years, in approximately half of their formulas. The reason given is that it tends to improve the action of all the other herbs and "harmonise" the action of the herbal formula. More recently, medical herbalist Gerald Green has elucidated its tremendous value in the reversal of auto-immune diseases. This action is far wider than just helping to treat specific diseases, other well-documented activities include significant anti-inflammatory effects, a protecting effect on the liver against toxic substances and anti-allergic activity. 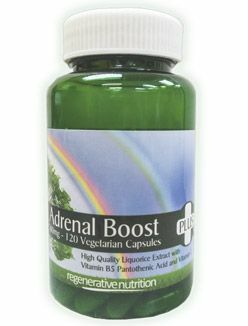 Adrenal Boost will, generally (for most people), give better clinical results in reducing auto-immune reactions, excess histamine and inflammation and further, raising low blood pressure than hydrocortisone (cortisol) will; IF TAKEN AT OPTIMAL DOSES. In some cases, physiological doses of hydrocortisone (up to 20 mg daily) alongside liquorice for serious adrenal hormone insufficiency may be required. However, in emergency cases, such as the rapid onset of autoimmune crisis, it makes sense to try/use high doses of liquorice for a limited period of time in preference to high doses of hydrocortisone. If this works well in such a crisis, this will give confidence of use for any future crisis. Not to be taken if pregnant, or suffering from high blood pressure. Sensitive individuals, in rare circumstances, may experience raised blood pressure when taking Liquorice herb. It is recommended that blood pressure is monitored during use. If a rise is noted, then usage should be reduced. Please see the further reading tab for more details of contraindications and use. Natur-Leaf is recommended for those who cannot use Liquorice, for whatever reason (high blood pressure, pregnancy etc). In cases of cortisol insufficiency; therapies (including nutritional and herbal therapies) that would normally improve physiological function are often counterproductive, due to a failure to adapt properly to these therapies. It is very common that if cortisol output is lacking, another hormone, aldosterone, also made in the adrenal cortex is often insufficient. Aldosterone helps maintain adequate blood pressure by preventing excess loss of salt and other minerals into the urine. Aldosterone deficiency can be resolved with the use of suitable doses of liquorice. However, it is unwise to supplement with both cortisol and liquorice for more than two to three weeks as this renders it difficult to estimate the actual amount of cortisol produced over a 24 hour period. This is discussed in the full notes linked above. For marked adrenal insufficiency or a crisis/acute emergency situation it is wise to start with actual cortisol supplement first (see Adrenal MAX Support +), and later experiment to see if one can move over to liquorice supplementation. Also regular use of liquorice at doses higher than 1.5g daily (equivalent to 1 capsule of Adrenal Boost +) in some people can raise blood pressure higher than normal. Those suffering from excessively high blood pressure are advised not to take liquorice. Regular home testing of B.P. is recommended. Full spectrum salt like Celtic Ocean Sea Salt can help balance blood pressure; increasing low blood pressure and often lowering high blood pressure. Note: All links to further information are given in the body of the text and also at the end of the article. Liquorice herb (Glycyrrhiza Glabra), the well known component of Liquorice sweets, is a surprisingly important medicinal herb. It has been used extensively in Chinese herbal medicine for thousands of years, in approximately half of their formulas. The reason given is that it tends to improve the action of all the other herbs and harmonise the action of the herbal formula. More recently, medical herbalist Gerald Green has elucidated its tremendous value in the reversal of auto-immune diseases. The patients he has treated have suffered from asthma, inflammatory bowel diseases, and multiple-sclerosis. However the action of liquorice is presumed to be potentially effective (depends on the person, diet etc not the particular disease, as they are all related), on all auto-immune diseases. This action is far wider than just helping to treat specific diseases. For example it includes many cases of inflammation and common conditions such as allergies. The auto-immune aspect of a health problem is extremely common, even though we may not be aware of this. This aspect is discussed more fully in the article Autoimmune Disorders. Autoimmune disorders are extremely common, due to many factors, such as stress, nutritional deficiencies, inoculations, electromagnetic pollution, lack of sunlight on skin and so on - the immune system becomes unbalanced so that on one hand, the immune response to virus and internal toxemia may be inadequate, and on the other, there is often an over-reaction. This results in inflammation, and attack on 'self'. This may range from something as simple as fatigue, allergies, or all the way through to a serious auto-immune disorder such as asthma, inflammatory bowel disorders, and many chronic diseases. Improving this balance with the use of Liquorice can make the totality of your nutritional supplements and diet work better for you, as realized by the Chinese herbalists many years ago. If we look at use of liquorice from a western perspective, we see that its use has changed little over 3,000 years. It is considered a demulcent (soothing to irritated membranes), expectorant (loosening and helping to expel congestion in the upper respiratory tract), and stimulates mucous secretions of the trachea. Other well documented activities include significant anti-inflammatory effects, a protecting effect on the liver against toxic substances and anti-allergy activity. Studies have shown that glycyrrhizin stimulates the excretion of hormones by the adrenal cortex. We have found liquorice to be effective in its ability to help the body produce the correct type and amount of natural steroids, whereas drug based steroids, in my experience are less effective and will in time seriously disrupt the body's homeostasis and render it susceptible to Candida Albicans infection and other health problems. The exception being bio-identical hydrocortisone. This form of natural cortisone at the correct dose for the individual will not have the harmful effect of the corrupted molecule of the patented version that is prescribed in excessively high doses. Glycyrrhizin has a similar chemical structure to corticosteroids released by the adrenals, and further studies have suggested that it could be used as an aid in helping to reduce withdrawal symptoms from dependency on some corticosteroid hormones. Glycyrrhizin has also shown estrogenic activity in laboratory animals, and is experimentally anti-inflammatory, anti-rheumatic, and antibacterial. In China, liquorice root is used as an antacid. How Does Liquorice Achieve its Action ? Liquorice contains Glycosides called glycyrrhizin and glycyrrhizinic acid, these have a structure similar to the natural steroids in the body and tend to rapidly restore natural steroid production from the adrenal glands. In addition, the direct action of these glycosides, along with other ingredients in the liquorice seem to have an almost magical effect in reducing inflammation and the entire auto-immune mal-response. Please note that if you suffer from systemic Candida Albicans infection, usually due to antibiotics, artificial steroids and other medicines combined with a long period of low immune system and poor diet, then you are unlikely to obtain full benefit from any herb or nutritional remedy, including liquorice. Remedies to eliminate Candida must be used along side or prior to any other remedies, please see the article on Candida Albicans. Generally these cautions are related to doses of over 1g a day, (although there are always a very small minority of individuals who react to any herbal product untypically, so in extremely rare cases even doses 1g a day may cause some of the listed side effects). It is not necessary to take blood pressure readings if consuming just 1 capsule (equivalent of 1.5g) daily, unless ones readings are typically over 150 Systolic. However it is highly recommended that blood pressure is monitored at anything over this level, and absolutely essential if taking 4 or more capsules daily. By doing so the potential side effects that are not strictly prohibitive, can be avoided. The potassium loss can also produce interactions with other drugs. The water loss-producing effects of conventional thiazide diuretics can be increased. In addition, if the individual is on digitalis glycoside heart medications (derived from foxglove), the potassium loss can actually increase the effect of the digitalis glycoside drugs by up to 50%. Since the toxic and effective doses of digitalis glycosides are in close balance, physicians should be aware of this potential drug interaction. About 20 percent of patients treated with liquorice in the 1950s (presumably at relatively high doses) experienced side effects such as water retention, upper abdominal pain, headache, shortness of breath, and stiffness. At first scientists thought this was an allergic reaction. Treatment with antihistamines brought no relief. The symptoms usually disappeared when the dose was reduced, though sometimes it was necessary to stop liquorice use all together. Similar symptoms have been reported from ingestion of large amounts of liquorice-containing candy, as well as by users of tobacco products flavoured with liquorice. To re-iterate, side effects are rare if the dose is kept around 1 capsule daily, and once again, with proper blood pressure monitoring, any side effects that are not strictly prohibitive can be mitigated even when using higher doses as are sometimes necessary. Liquorice has been used extensively throughout history in foods, and herbal remedies, and being extremely beneficial for the vast majority of those taking it, one need to keep a balanced view concerning the safety issues. Higher doses, as discussed in the article linked below, can have wonderful effects on those with adrenal fatigue and insufficiency and health problems that arise from such. High doses may only be needed for a period of time and can then be reduced. If there is unusual stress in any form; to avoid adrenal insufficiency re-occuring dosages can be increased again for a period of time and experimentally reduced to see if lower doses are sufficient. List of Auto-immune disorders that Liquorice may help to resolve as part of an over-all nutritional therapy. If we look at use of liquorice from a western perspective, we see that its use has changed little over 3,000 years. It is considered demulcent (soothing to irritated membranes), expectorant (loosening and helping to expel congestion in the upper respiratory tract), and stimulates mucous secretions of the trachea. Other well-documented activities include significant anti-inflammatory effects, a protective effect on the liver against toxic substances and anti- allergic activity. Studies have shown that glycyrrhizin stimulates the excretion of hormones by the adrenal cortex. One of the better known folk uses of liquorice in Europe has been in the treatment of gastric ulcers. Also gastric distress, acidity etc are often quickly relieved. Based on this historical use in European herbal medicine, liquorice has been widely used as a treatment for gastric ulcers. Modern use began in 1946, when a Dutch physician, F. E. Revers demonstrated that liquorice was the active ingredient in a domestic medicine used in the Netherlands, then reported good results obtained in the treatment of stomach ulcers in 32 patients. In the 1950s new research showed that liquorice-derived compounds can raise the concentration of prostaglandins in the digestive system that promote mucous secretion from the stomach, as well as produce new cells in the stomach lining. It was also shown that liquorice prolongs the life span of surface cells in the stomach and has an antipepsin effect. The combined effect leads to the healing of ulcers. If you suffer from stomach ulcers the recommended formula our Digestive Disorders Herbal Blend which contains Liquorice, and King of Bitters. Powdered liquorice is also considered by Ayurvedic medicine as an excellent remedy for hyperacidity, and clinical tests prove that it is good for relieving pain, discomfort and other symptoms caused by acid matter in the stomach. It removes the irritating effects of acids in a better way than alkalis. In Europe, the primary medicinal use of liquorice is to treat coughs, colds, and other respiratory infections. Glycyrrhizinic acid seems to stop the growth of many bacteria and of viruses such as influenza A. It also stimulates the production of interferon. We find it particularly effective as part of a natural treatment for lung problems, and infections that affect the lungs, and as previously mentioned asthma and bronchitis. Chinese researchers agree that liquorice is effective against cough and soothes the inflamed tissues of a sore throat. In fact, ancient Chinese texts summarize the uses of liquorice rather well: "improve the tone of the 'middle Jiao' [digestive system] and replenish Qi, to remove 'heat' and toxic substance, to moisturize the lungs and arrest coughing, and to relieve spasms and pain." Modern practitioners use different terminology, but the therapeutic benefits are quite similar. Liquorice Root has been used as a laxative; to adjust blood sugar, reduce pain from ulcer and arthritis. Also used to treat ulcerative colitis in China. In Japan, physicians use liquorice to treat chronic hepatitis B. ( Milk Thistle is also suggested for hepatitis as is King of Bitters). Glycyrrhizin interferes with hepatitis B surface antigen and is synergistic with interferon against hepatitis A virus. It is also used at times to treat hepatitis C. Researchers have also demonstrated that liquorice helps protect the liver from damage due to chemotherapy. At low doses, the herb stimulates the liver to manufacture cholesterol and excrete it in bile. This can help lower serum cholesterol levels.Physicians in China may prescribe liquorice alone or with cortisol to treat mild cases of Addison's disease, in which the body produces too little of this hormone. In China, liquorice is considered a powerful antitoxin and is used as an aid in the treatment of pesticide poisoning. It may also curb Plasmodium falciparum, the parasite that causes malaria. (Wormwood is also indicated for Malaria). Glycyrrhizin also has some antioxidant properties. Liquorice has been used to ease symptoms of menopause. In one study, liquorice attached to estrogen receptors. It did not, however, promote the growth of uterine cells as estrogen does, and it is not frequently used for this purpose in the United States. Another adaptogenic effect from liquorice involves estrogen. Liquorice shows mild estrogenic properties similar to other phytoestrogens. It has the ability to promote estrogen production and to interfere with the effects of too much estrogen, especially from external sources. The flavonoid constituents are thought to be responsible for the estrogen-like effects, while glycyrrhetinic acid antagonizes estrogen where there is over-stimulation of estrogen receptors in the body. All this makes liquorice useful in controlling the menstrual cycle and in relieving PMS and menopausal symptoms. Besides treating ulcers along the digestive tract, including the mouth, liquorice may be used for viral infections like a cold, inflammation as in arthritis, menstrual and menopause disorders, herpes, eczema and psoriasis, allergic disorders, asthma, chronic fatigue, depression due to hormonal imbalance, emphysema, and hypoglycaemia. Ayurveda recommends liquorice as an effective expectorant, helping to liquefy mucus and facilitate its discharge from the body.